This is a book review of Sharp Objects by Gillian Flynn. Be warned! Serious spoilers inside. 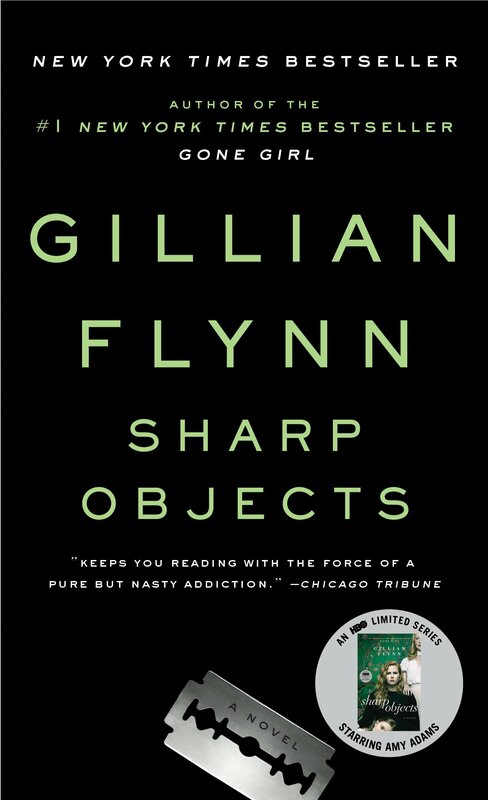 I excitedly picked up Gillian Flynn’s debut novel Sharp Objects to read while on holiday. I had enjoyed Gone Girl and was ready for some similar shock-value thriller with an edgy female protagonist who wouldn’t conform to the binary norms of good girl/bad girl. I was not disappointed. While I whiled away the day blazing through this book, I found myself immersed in the gossip and rumours so typical of small-town America. I eagerly followed Camille Preaker, a 30-year-old underachieving reporter, as she returns to her hometown to investigate a series of child murders. Once there, she is forced to come to terms with her past, her mother, a half-sister she barely knows and ultimately finds out “whodunit.” The book is dark. It explores some pretty heavy themes such as the sexualisation of children, drug use, self-harm, parental abuse and alcohol dependency. Yet, I couldn’t put it down. Overall, it’s an entertaining read and exactly what I was after. Although, perhaps the book was a little more than that. Saying “entertaining read” is like calling a person “nice,” meaning they haven’t made too much of an impression but you get along ok all the same. Yes, Sharp Objects was a good read, but I also found it to be intriguing, memorable and, more than just entertaining, I found it to be thought-provoking. As the story progresses, we start to see some peculiarities about Camille. She has this odd habit of writing on herself. To begin with, I thought this was just a rather lame attempt to make her slightly more interesting. Oh, a lead female with a quirk. How original. But then it takes a dark turn. She actually sees the words that she writes already emblazoned in her skin. Names of people, her feelings, random objects, descriptions of how she perceives herself and demanding commands come up everywhere. She then cuts. Her whole body is mottled with scars from where she has written these words with a blade into herself over and over again. In fact, Camille has only recently been released from the psych-ward where she had institutionalised herself after carving a final work into her neck: vanish. Undoubtedly, this woman is messed up. This got me wondering, why do so many main characters have mental health issues? Is it that we are all a little insane and have some morbid curiosity about what it would be like to experience our insecurities at their extremes? Or is it that mentally unstable people are simply more interesting to read about than the average human being? I tried to picture myself slicing into my own skin – feelings, impulses, questions, desires – but I just couldn’t imagine it. Yet I can see Camille doing it. I can feel the excitement, rush and release as she describes puncturing herself with sharp objects. I guess for me the only way to experience this kind of headspace is through first-person narrative and Flynn does it particularly well. Her abrupt, some-what jarring stream of consciousness writing provides a compelling insight into the intricacies of Camille’s mind. I came to understand her character and her motivations, to empathise with some of her decisions and dislike her for others. Indeed, she defies the typical roles of lead female characters who we seem to either love or love to hate. Another admirable aspect of Flynn’s writing is her knack for plot twists. Her addictive style of thriller is laced with unexpected turns and surprising reveals. I’m curious about her method. Where does she start when she creates these fictions? Is it a linear process that starts at the beginning, proceeds through the middle and finishes at the end? Or does she go back and forth, working across the entire storyline to find ways and means of thickening the plot? To be honest, the mother turning out to be a Munchausen-by-Proxy killer was not so surprising, nor was Camille’s half-sisters Amma’s role in the murders. After all, Flynn had set this up nicely with well-placed comments and clues along the way. However, Amma’s creative use of the dead girls’ teeth to imitate the ivory floor of the family mansion in her replica dollhouse was quite ingenious. I really had no idea where the missing teeth might be right until the very end. This part of the story was grotesquely enthralling, to say the least. However, there was one option for more nail-biting misdirection that I felt Flynn could have exploited a little more: the aloof step-father, Alan Crellin. He is a strange shadow of a man that made no connection with Camille despite being in her life from the very beginning. He also has little to no relationship with his daughter, Amma. Alan appears as more of a side note, but his awkward hovering in the background seems like cause for alarm. “Such an odd and quiet man must surely be hiding something,” I thought to myself as I tried to guess who the killer(s) may be. I am yet to watch the TV series based on the book but apparently the writers/producers/whoever made the script also noticed this and developed the doubt surrounding him much further. As clichéd as it may be, Sharp Objects is a true page-turner. Admittedly, the topics are challenging. Indeed, there is nothing easy about child abuse, self-mutilation or mental illness, but the book itself is an addictive read. Fans of thrillers and those looking to read beyond the standard femme fatale or damsel in distress narrative can’t go wrong. Like I said, I found Flynn’s novel highly entertaining and quickly read the whole thing in two or three days. Then I found myself thinking about it and the characters days after. It’s definitely worth a read.